In parts 1 and 2 of the series Becoming a Home Stager: Running a Successful Home Staging Business, we started looking at and overcoming the top obstacles that home stagers tend to find in their path to success. Part 2 of this series, Team Blueprint, dealt with trying to do everything yourself. Today, we’ll discuss the second most common problem, not having a plan. I know we’ve all heard the saying, “You don’t plan to fail, you fail to plan.” Well, these are the rules to live by in business. Without a solid business plan, everything is at the whim of the day or the emergency, or even worse – your business is just floating on the breeze, waiting to see where the wind will carry it next. Only three percent of the graduates had written goals and plans; 13 percent had goals, but they were not in writing; and a whopping 84 percent had no specific goals at all. Ten years later, the members of the class were interviewed again, and the findings, while somewhat predictable, were nonetheless astonishing. The 13 percent of the class who had goals were earning, on average, twice as much as the 84 percent who had no goals at all. And what about the three percent who had clear, written goals? They were earning, on average, ten times as much as the other 97 percent put together. I provide this information in all of my home staging classes, because I think having a solid business plan is one of the best things you can do for your business and to me, this information is staggering. After reading the statistics for this, how can you not decide to make time for something so simple as writing a business plan? Think both long term and short term. Decide where you want to be, then create a path to get there. I think of this like a maze. Have you ever done a maze backwards? 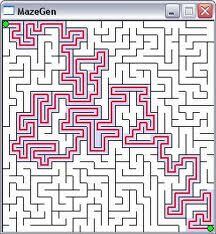 Have you noticed how much easier it is to do the maze in reverse than it is to start at the beginning? When you work from the destination rather than the beginning, you eliminate the majority of potential distractions and diversions. When there is a fork in the road, you’ll know which road you should be taking. Life, business and goals change. Your plan should be revised at least annually, new businesses, possibly twice a year, and they should allow for alterations as necessary. When new technology or opportunities do arise, the business plan will allow you the foresight to know if you should move in that direction or not. What’s the plan? What’s the end game? If you need help creating a comprehensive business management plan, then we have a workbook that may help you. It will walk you through, step by step. Once you’ve answered all of the questions, you will find your plan is complete. You can also find free business plan guides at the Small Business Administration. Hi there…I am interested in home staging. I have been flipping homes for the last couple years and I am looking into starting up a home staging business. I live in Cleveland, Ohio. What are the first steps towards this and making sure it is something sellers/buyers would be interested in? Thank you for your time!